The logical flipside to the deep house revival is a resurgence in girl-fronted R&B. Back in the 1990s, the two went together like sweat and global hypercolor t-shirts. So it's a happy coincidence that after writing about Juce earlier today that *ping* up popped a new band called EKKAH. 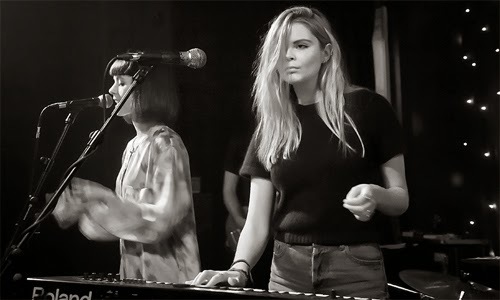 Formed by Rebekah Pennington and Rebecca Wilson (hence the name), they’re a UK duo who describe their sound as "pop/girl funk with a big, polished sound". "We've been friends for years," says Rebecca. "We bonded over rock ports in maths class and started playing some music together." Their first demo, 7AM, got a fair bit of attention earlier this year. Now, they’ve got a proper single together – and it's a sublime summer soul jam, called Figure It Out. "We had some ideas for Figure It Out whilst travelling in a car together," Rebecca says, "so hopefully people will listen to it whilst heading off on a summer road trip!" She's not wrong. This would be the perfect soundtrack for cruising down the Californian coast in an open-top Chevrolet (I assume – this being an scenario I've only experienced via years of listening to Bruce Springsteen). In fact, with its woozy synth strings and rubbery G-funk bassline, it could only sound more 1990s if Warren G** showed up for a guest rap. ** Warren G is now 43.